Planet Hugill: Mahler distilled: Iain Farrington and Rozana Madylus in "On Angels' Wings"
Mahler distilled: Iain Farrington and Rozana Madylus in "On Angels' Wings"
Pianist and composer Iain Farrington is perhaps best known for his distillation of composer's larger scores for smaller instrumental forces, and perhaps his current concert series at 1901 Arts Club represents the ultimate distillation as he is exploring Mahler's ten symphonies and Das Lied von der Erde in a series of piano recitals, playing his own transcriptions of many of the Mahler symphonies. For his second recital in A Mahler Piano Series at the 1901 Arts Club, on Wednesday 19 September 2018, Iain Farrington was joined by mezzo-soprano Rozanna Madylus for On Angels Wings, focused on Mahler's Second Symphony (written between 1888 and 1894, premiered 1895) with Iain Farrington's transcription of the original version of the Totenfeier movement (written 1888) from the symphony, traditional tunes which Mahler used in the symphony, music which influenced him with the first movement of Beethoven's Sonata in A flat major and Die Erlösung from Wagner's Parsifal (1882), a sequence of songs which related to the symphony, Mahler's Wo die schönenen Trompeten, Des Antonius von Padua Fischpredigt and Urlicht, Schumann's Das ist ein Flöten und Geigen and Klopstock's hymn Die Auferstehung, and a group of songs by Mahler's contemporaries on similar themes to the symphony, Wagner's Der Engel (1857, from the Wesendonck Lieder), Brahms' O Tod wie bitter bist du (1896, from the Four Serious Songs), Richard Strauss' Befreit (1898) and Elgar's The Angel's Farewell (1900, from The Dream of Gerontius). 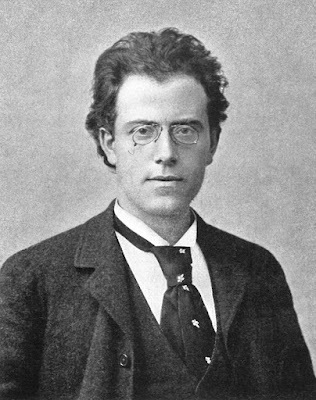 In an age before computers and synthesisers, the piano transcription was an essential tool in a composer's armoury, composer pianists like Mahler would play their symphonies to selected people and in fact Mahler cut piano rolls of music from his symphonies. Mahler's younger English contemporary RVW would have a play through of his latest symphony in piano form with a trusted pianist before a small group of friends. So the idea of a Mahler symphony on the piano is more suitable than we think. In the case of Mahler's Symphony No. 2, the size of the piece and the extra forces it uses (including chorus and off-stage brass) rather made it less than possible, hence Iain Farrington's decision to give us a recital around the subject. What was attractive about the programme was that if you knew Mahler's Symphony No. 2 then you found Iain's programme and spoken introductions fascinating and illuminating, shedding new light on the music, whilst if you did not know the symphony then the programme hung together as an entity in its own right, with the sequence of songs in the second half being particularly satisfying. Iain is playing the Mahler symphonies in his own transcriptions, creating a more pianistic texture than the standard vocal score type transcriptions give us, making the pieces live on the piano. We started with Beethoven's Sonata in A flat major, the first movement which is a set of variations. Beethoven was a big influence on Mahler and this movement is, in fact, a close cousin to the second movement of Mahler's symphony, same key and time signature. Iain gave quite a stately performance with nice rhythmic inflections, developing skittish moments as the variations progressed but keeping a serious approach, and the darker moments really suited the mellow sound of the piano. Next came a pair of traditional tunes which Mahler used in the symphony, first the delightful Weinsteirer Landler, a sweetly lilting piece which Mahler used because for him the Landler evoked happy times in the past, and secondly the Jewish Dem Rebns Nign, a strikingly atmospheric piece which clearly showed the Jewish influences in the third movement of the symphony. Next came Iain transcription of the concluding Redemption music from Wagner's Parsifal; when Mahler first heard Parsifal he could not speak for days. It was a remarkably effective performance, with Iain's transcription and playing bringing a lovely clarity of texture to the piece, as well as giving it a lovely warmth. Finally, in the first half, we heard Iain's transcription of Mahler's Totenfeier a single movement orchestral work which he wrote at the age of 28 (in 1888), and only 6 years later did he incorporate the movement into his new symphony. The music has strong links to the conductor Hans von Bulöw (conductor of Wagner's operas, first husband to Wagner's wife Cosima). Mahler played Totenfeier to von Bulöw who hated it (evidently putting his hands over his ears at one point!). Yet at von Bulöw's funeral in 1894, when Mahler heard Klopstock's hymn Die Auferstehnung he had the inspiration to create the symphony, which concludes with Mahler's setting of Klopstock's text. Totenfeier means funeral (or burial) rites, and Iain performance started in a dramatic manner and was vibrantly engaging throughout. He was adept at creating a real sense of atmosphere in the piece, and again the clarity of textures was foremost. And the climaxes were terrific, with streams of notes, this was a really effective piece for piano which in the relatively intimate confines of the 1901 Arts Club truly evoked Mahler's symphonic writing. For the second half, Rozanna Madylus and Iain Farrington started with Mahler's Wo die schönenen Trompeten, the first of three Mahler songs all from Des Knaben Wunderhorn. Here the piano had a very definite presence, complementing Rozanna Madylus' lovely straight mezzo-soprano voice. She has quite a rich, dark voice and sang the song in quite a serious manner prizing sober atmosphere over story-telling. They followed this with Schumann's Das ist ein Flöten und Geigen which was a big influence of Mahler's Des Antonius von Padua Fischpredigt which followed it. The Schumann was very vivacious, but also quite strongly sung, whilst both performers gave wonderful character to Mahler's setting of St Anthony of Padua's sermon to the fishes, with Rozanna Madylus relishing the story here. Next came a very sober, very concentrated account of Mahler's Urlicht which developed into a highly passionate conclusion. Finally in this group, quite a straight rendering of Klopstock's hymn Die Auferstehnung. The final group of songs started with Bruckner's sacred song, Ave Maria (setting the standard Latin text). It was definitely a song (rather than a solo motet), yet I am not quite sure I would have guessed it was by Bruckner. Wagner's Der Engel is, of course, better known and here we had the benefit of the way Rozanna Madylus really filled the phrases out whilst keep a strong sense of line, serious yet intent, with a lovely postlude from Iain. Brahms' O Tod, wie bitter is du was one of the last songs he wrote, it comes from the Four Serious Songs which he wrote on Clara Schumann's death. Whereas Bruckner was a devout believer, here we have an agnostic composer writing about death. And the song received a strong performance with Rozanna Madylus making a lot of the words. Richard Strauss' Befreit is remarkable for the way it gives no hint of God or the afterlife. It opened with a dignified, dark piano prelude followed by Rozanna Madylus' lovely straight tone voice with some superb climaxes. Finally, we heard a dignified and moving account of The Angel's Farewell from Elgar's The Dream of Gerontius. Lovely as it was though, I have to confess that I rather missed the sound of the chorus. Iain Farrington's A Mahler Piano Series continues on Wednesdays at the 1901 Arts Club. On 29 September, Iain will be performing his own transcription of Mahler's Symphony No. 3 and will be joined by soprano Sarah Gabriel for songs associated with the symphony.